President George W. Bush had major problems selling his disastrous invasion plans for Iraq. The public smelled a rat. Strong majorities of both Democrats and Republicans opposed a preemptive invasion without confirmation of weapons of mass destruction (WMD) by UN inspectors. That was during December 2002 and January 2003. Bush needed something special to push his diabolic plan over the top. 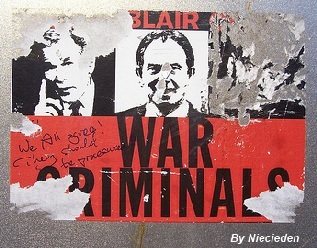 Blair’s government released two fraudulent intelligence papers during the critical period just before the March 2003 Iraq invasion, the September 2002 report and the Iraq or Doggy Dossier in early February 2003. Rupert Murdoch’s media cartel led the charge for war. He headlined stories about both bogus reports including the outrageous claim that Iraq could launch chemical weapons at the invaders within 45 minutes of an attack and the big lie about Iraq seeking uranium from Niger to develop nuclear weapons..
Tony Blair is guilty of the very same crimes as Bush: murder, assault, and fraud by lying to the people to justify a preemptive attack that resulted in deaths and injuries, traumas and displacements, with a total cost that has helped ruin the U.S. economy – $3.0 trillion. Rupert Murdoch and his minions share that guilt as the public relations shop for the road to perdition. During the morning hearing, Blair was questioned by Queen’s Counsel (QC) Robert Jay who carefully laid the foundation for key questions. Blair also began laying his own foundation, a staccato mantra of answers to questions not asked. Blair emphasized the rationale for his overall media policy on at least three, perhaps more, occasions. He had no objection to foreign ownership (read Murdoch) of British media properties. He was inclined to be a free marketer on media and thus not in favor of tight regulation. Blair argued that the “culture and rules under which people play” were the most important factors in a positive media policy. The former Prime Minister repeated several times that he was unwilling to risk the New Labour agenda over a fight to tighten the Communications Act given the relentless attacks he could anticipate from the tabloid press. Jay raised questions about the period between September 15, 1994 and May 1, 1997. The QC referenced a private meeting that Blair had Murdoch lobbyist Gus Fisher in 1994. Blair was clear that a Labour government would not have major concerns regarding cross-media ownership (e.g., television, newspapers, etc.). QC Jay also pointed to the extraordinary effort Blair made to attend and speak at a News Corp conference in Australia. Blair presented the meeting with his overall views on media ownership. Jay asked Blair if the meeting was used to “curry favor” with Murdoch. Blair demurred and then denied that this was the case. Jay inquired about three calls Blair took from Rupert Murdoch just before the Iraq invasion on March 11, 13, and 19. What were he and Murdoch talking about, the counsel wondered? Blair said that this was “normal” when facing such a big issue (normal talking to Murdoch?). He also noted that Murdoch had as good a read on “what was going on in the United States” as any expert he’d asked. QC Jay then asked if there was any connection between the call with Murdoch on March 13 and the incredibly vicious personal attacks on French President Jacque Chirac the next day in Murdoch’s Sun newspaper. Chirac had refused to become part of the coalition of the willing to invade Iraq. There were rumors that Chirac was considering a UN Security Council veto of the vote that could be construed as legitimizing war. Blair denied any part in encouraging or even knowing of the Murdoch hatchet job. Leveson was very upset, as well he should have been, and called for an investigation of the security lapse. The hearing paused for lunch and resumed with Jay continuing unflustered with questions. . 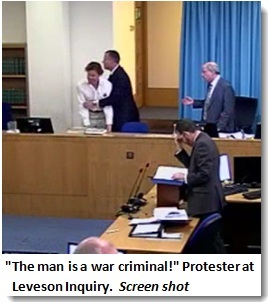 While Jay appeared to show no reaction to the intrusion and seemed ready to go the distance with Blair, Leveson was shaken and ended the hearing an hour early. Rebekah Brooks’ answers at the inquiry were clearly outside the recommendations for witnesses under adversarial examination. Stick to simple answers, take your time, don’t volunteer information not asked. Blair’s responses verged on pressured speech and had all the appearances of preemptive strikes against anything critical that the inquiry might produce. His self-described position on media policy was wildly inconsistent with the claim that he wasn’t going to risk the New Labour agenda over a fight for tighter media rules that may have offended Murdoch. As he described his media agenda time and again during the hearing, there was no conflict with New Labour Prime Minister’s media policies and Murdoch’s core requirements. Favoring foreign ownership of British media meant favoring Murdoch ownership. After all, Murdoch is a foreigner in Great Britain. Favoring light regulation was also music to Murdoch’s ears. So, how on earth was Blair going to risk his grand agenda by taking on Murdoch regarding media regulation? There was no conflict, therefore no risk. Blair used plagiarized, self-serving, false intelligence information to enable the terrifying claim Bush needed to get just enough support to invade Iraq: The British government has learned that Saddam Hussein recently sought significant quantities of uranium from Africa. Hussein would soon have a nuclear weapon. The British told us so. We must invade! This was an act suitable for Le Théâtre du Grand-Guignol. If Blair would participate in lies of this magnitude and deadly impact, then he cannot be believed on subordinate issues that might threaten his reputation and freedom. Today’s testimony was a pack of Blair lies by a certifiable sociopah designed to score points for his tattered reputation. It’s a shame that QC Jay had his examination terminated early. In the morning session, Jay made a veiled allusion to a secret meeting between former Prime Minister Margaret Thatcher and Murdoch. In his self-deprecating style, Jay said his failed attempt at humor referred specifically to the January 4, 1981 Thatcher-Murdoch meeting. Denied for years, notes on the meeting were discovered by Cambridge University archivists. Shortly after their tête-à-tête, Murdoch was able to bypass the legal prohibition against a foreigner purchasing The Times of London. Then Australian citizen Murdoch made an acquisition that was to confer legitimacy on his criminal operation. Who knows where QC Robert Jay would have gone with that theme absent the raucous entrance by the protester at stage center proclaiming the obvious? One thing we can conclude is that Tony Blair felt the urgent need to justify his behavior with Murdoch. He must be very afraid of something.